The SG ProPad, and its six-button successor, the SG ProPad 2/SG ProPad 6 (IMAGINEER DIGITALPAD MD in Japan), are two third-party controllers for the Sega Mega Drive developed by Recoton and their STD Manufacturing devision (being released under the QJ and InterAct brands). They are simple control pads with turbo features. Three different variants of the controller were released. 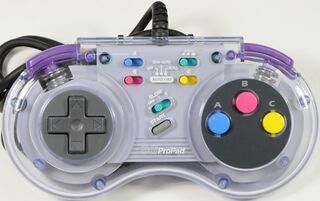 The original SG ProPad is a simple three button controller built similarly to a Super Nintendo controller (the shells were in fact recycled from Recoton's "SN ProPad" range). Later a six button variant was released titled the All New SG ProPad, which merely adds a button and replaces a turbo switch for the MODE button. The SG ProPad 2 and SG ProPad 6 have completely redesigned shells, utilising a function key to set each button's turbo speeds as opposed to cluttering the controller with switches. The two seem to be identical, though the ProPad 2 is far rarer than the ProPad 6.